Video: Scott Britton tells voters about his platform. Learn more about Candidate Free Time. My vision is to marshal all the substantial resources of the county to maintain service levels to all our residents particularly those most in need of County services. My plan is also to provide these services in a cost effective manner while maintaining a strong financial condition for the county without new taxes. The budget is the most pressing concern especially after the roll back of the sweetened beverage tax. Improved management of County resources is key to address the providing of essential services in our justice system and county health organization with a clear commitment to fiscal responsibility. My name is Scott Britton, and I am the Democratic candidate for the Cook County Board and the 14th District. 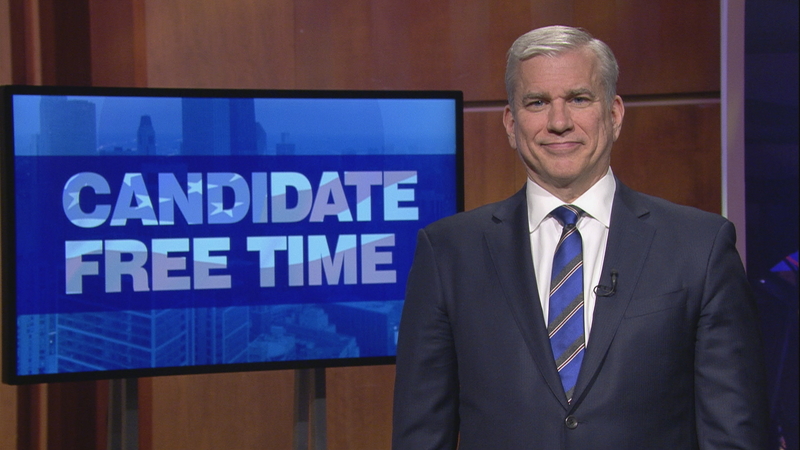 I want to thank WTTW for this opportunity to speak to voters in my district about why I am running. I am seeking this office to help the working families of the 14th District by improving the function of Cook County government, while maintaining strong fiscal oversight, always keeping in mind the sometimes onerous tax burden our residents must endure. Cook County has seen too much lack of imagination in its operations of government over the last several decades. We need to look at different methods for providing government services. Much of the functioning of Cook County government seems to be based on the phrase "we have always done it that way". Business as usual, particularly in government operations, is no longer acceptable and new, vigorous leadership is needed to change the mindset and operation of Cook County government. While serving on the District 34 School Board, and during my nearly 12 years on the Glenview Village Board, I have seen the importance of new ideas and creative thinking in government operations. During my time in government I have led reform efforts so that we may provide quality governmental services at a reasonable cost. If elected to the Cook County Board I will work actively in addressing our continuing problems particularly as it relates to the budget. We can reduce the costs associated with the Cook County criminal justice system by ending the policy of using incarceration to treat substance abuse. The County maintains roads and unincorporated areas that need to be annexed to the communities where they are located, thus eliminating costly County services. We need to consolidate and economize the Cook County health care system through reorganized delivery methods and improved contract management. I became involved in public service in order to foster progressive values in my community. As Dr. Martin Luther King Junior said "life’s most persistent and urgent question is what you are doing for others?" I will live these words in my service to Cook County, by protecting our most vulnerable residents and promoting legislation that will assist the working poor and those in need. I hope to talk with many of you as I campaign over the next several months and please feel free to visit my website to learn more about my positions at www dot Scott Britton dot com. Thank you very much for listening and I hope I can count on your vote on November 6.